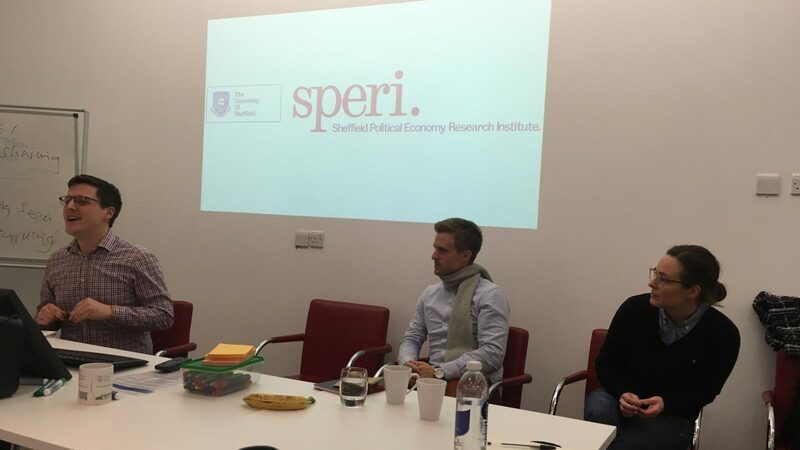 SPERI has launched a new network for doctoral researchers at the University of Sheffield. The new interdisciplinary network will be convened by Ed Pemberton, Patrick Kaczmarczyk and Kaisa Pietila. The Doctoral Researchers Network aims to connect postgraduate researchers across the university who are working on topics related to SPERI’s core research themes. These themes intersect across many different disciplines, covering numerous fields of research and areas of study. The network will be a space for PhD researchers working on political economy to come together, discuss their work and learn from each other and from researchers at SPERI about conducting political economy research. A successful launch event was held on February 5th attended by doctoral researchers from the Departments of Geography, Urban Studies and Planning, Philosophy and Politics, the Management School and the School of Education. Other members of the network are drawn from the Departments of Journalism, Sociological Studies and the School of East Asian Studies, and the Law School. The network will meet regularly and the convenors have already lined up a number of exciting events for 2019 including an academic publishing masterclass with Daniel Mügge (University of Amsterdam), a former lead editor of the journal Review of International Political Economy, and a methods masterclass session with Jacqueline Best, Leverhulme Visiting Professor at SPERI. If you are a doctoral researcher and would be interested to join the network please sign up here or contact Ed, Patrick and Kaisa for more information.